PeaceGeeks is excited to announce that we have received funding of $1.1 million CAD from the Government of Canada to launch a new capacity building program in Jordan that responds to hate speech, polarization, discrimination and extremism online. In recent years, violent extremist groups have used media tactics, such as mobile apps, print magazines, high-end videos, documentaries and social media to effectively recruit and incite violent actions. The Meshkat Community (مجتمع مشكاة) project engages Jordanian activists, artists, religious leaders and other community stakeholders, particularly youth, to strengthen their capacities and share best practices on promoting alternative narratives to violence and extremism in Jordan and across the Middle East. PeaceGeeks aims to give community members the digital skills and platforms to collaboratively create and amplify culturally-relevant media that promotes acceptance, tolerance and understanding. The resulting digital content will be produced and featured via social media, YouTube channels, the Meshkat Community website, artistic displays and more. 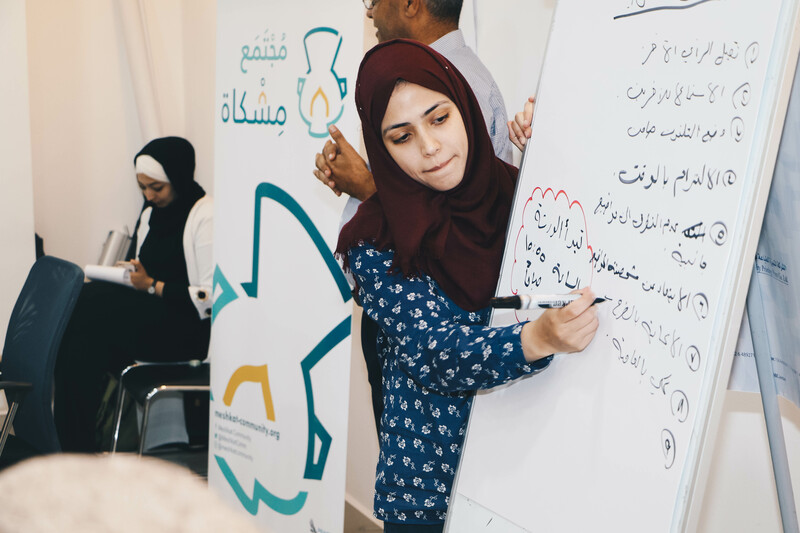 The project launches with a series of community workshops, co-hosted with partner NGOs including Tech Tribes, Kharabeesh, Nawafth and JOHUD, that aim to incubate ideas for the creation and dissemination of positive narratives, as well as promote dialogue on strengthening community resilience. Meshkat Community will also gather our first cohort of four local artists who will be trained on strategies for furthering tolerance through their art. The resulting creative productions are independent works of the artists, but will be disseminated in conjunction with PeaceGeeks. In recent years, violent extremist groups have used media tactics, such as mobile apps, print magazines, high-end videos, documentaries and social media to effectively recruit and incite violent actions. The launch of Meshkat Community comes at a crucial juncture for Jordan, which faces regional tensions due to the influx of 2.7 million refugees, and has seen upwards of 2,000 of its citizens, mostly young men, travel to join extremist organizations such as Daesh (ISIS). While the Jordanian government has launched various programs to counter the spread of extremist ideology, there is much still we can learn from the efficacy of grassroots anti-extremist messages initiated from within Jordanian society and amplified by the power of social media. The Meshkat Community Arabic language website will go live in May, with an English version to follow. In response to a request for support from the OCHA on March 13, PeaceGeeks and other members of the Digital Humanitarians Network activated emergency support teams to help collect information about the situation on the ground towards helping responders to make effective decisions around how to deploy humanitarian resources. Collecting the 3W's - who, what, where - for the response. PeaceGeeks, in partnership with GISCorps, MapAction and Humanity Road led on task #1 and played a support role on tasks #2 towards supporting early response efforts. Vanuatu Basemap Layers - Shapefiles were downloaded from Humanitarian Response and turned into feature layers on ArcGIS Online for basemap information such as island names, administrative boundaries, and roads. Social Media Early Indications Map - The above updates were summarized to indicate impact on each island of Vanuatu on an ArcGIS Online Map. A number of volunteers were brought in via PeaceGeeks who had local knowledge of Vanuatu. This played a key role in assisting with translation, local names and verification of information. This will the first time a DHN activation specifically aimed to recruit people with local knowledge, and it was broadly agreed that this provided a significant boost in strengthening the quality of the information provided. These tools play a key role in helping humanitarian responders, including UN-OCHA, the government of Vanuatu, humanitarian organizations and local organizations, to effectively deploy resources to the affected areas. As of March 23, there were still 4 islands where there had been no contact at all since Pam. Efforts were underway to source satellite data to assess the level of damage. In addition, PeaceGeeks continues to be in direct contact with the government of Vanuatu regarding setting up an SMS-based reporting mechanism to assist with collecting information and reports from the islands on an on-going basis. Want to volunteer with PeaceGeeks? ​To join our volunteer team, click here! As you may have heard or read about in the last newsletter, Amani is a new platform being built by PeaceGeeks to help with efficiency Of delivering services to our partners. Amani is an open source platform that utilizes mapping technologies to support work and decrease time to create a website. Crisis mapping and content management capabilities. We look forward to being able to support our partners more effectively with the improved Amani! If you would like to read more about the CEWIGO project, check out Cheryl's CEWIGO process book. Cheryl won both the 2011 Jim Rimmer Scholarship and the GDC National/ Ray Hrynkow Scholarship for Design for her work exceptional work on the CEWIGO project.